How to Uninstall SUPERAntiSpyware Professional on Windows OS? Home »	Uninstall » How to Uninstall SUPERAntiSpyware Professional on Windows OS? 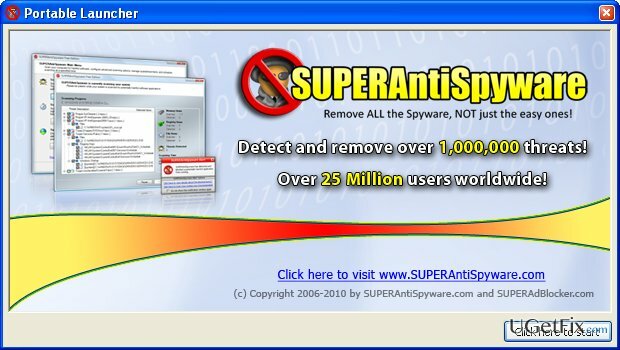 Issue: How to Uninstall SUPERAntiSpyware Professional on Windows OS? I need your help. A month ago I have installed SUPERAntiSpyware trial. The trial already expired and now I want to uninstall this program. I didn’t like a lot of things about it, so consider installing another anti-malware. I don’t know how to remove trials, please help. Thanks! It’s very important to take care of your computer and having a reliable anti-malware is probably a number one concern. Therefore, installation of SUPERAntiSpyware Professional is praiseworthy selection. This software is capable of detecting and removing thousands of cyber threats, including spyware, Trojans, malware, keyloggers, adware, browser hijackers, worms, and so on. According to its developers, this antispyware offers “many unique and powerful technologies removes spyware threats that other applications fail to remove.” However, for some reason this software haven’t been excluded as the one of the best, so it’s not irreplaceable. People who like SUPERAntiSpyware Professional anti-malware can have it and can be calm about their PC’s protection. If, nevertheless, the application did not meet the expectations, it’s advisable to try another antispyware, especially having in mind how many of them are available on the Internet for free. However, it’s important to remember that two anti-spywares can’t work alongside. Thus, it’s a must to remove SUPERAntiSpyware Professional completely before downloading and installing another PC guard. If you want to do that by your own hands, you can find manual SUPERAntiSpyware removal guide down below. Nevertheless, you can use an automatic removal option, which will save your time and ensure a full software removal from the first time. For that, you just have to install Perfect Uninstaller. In order to perform SUPERAntiSpyware Professional removal successfully, it is advisable to log in the system as an Administrator. NOTE that you will need a password for that. After that, press Ctrl + Alt + Delete to open Task Manager. Find SUPERAntiSpyware Professional there, click on it and select End Task. After that, you will be able to uninstall SUPERAntiSpyware Professional. Find SUPERAntiSpyware Professional, click on it and select Uninstall. The process will automatically finish. Unfold KEY_CURRENT_USER\Software, HKEY_LOCAL_MACHINE\SOFTWARE and HKEY_LOCAL_MACHINE\Software\Microsoft\Windows\CurrentVersion\Run\eg ui folder and remove SUPERAntiSpyware folder. Find SUPERAntiSpyware Professional on the list and remove it. As soon as the list of programs opens, find SUPERAntiSpyware Professional, and select Uninstall. Once the Windows Registry Editor is open, go through all the programs on the list and find SUPERAntiSpyware Professional. Right click on it and select Delete. Manual SUPERAntiSpyware Professional removal is not difficult, indeed. However, this process has to be done very accurately because it’s difficult to locate all the small files that belong to this program. If you accidentally fail to remove any parts of this software, they may further disrupt the performance of the further anti-malware tool. Thus, to ensure a smooth SUPERAntiSpyware Professional uninstalling, we recommend using Perfect Uninstaller.